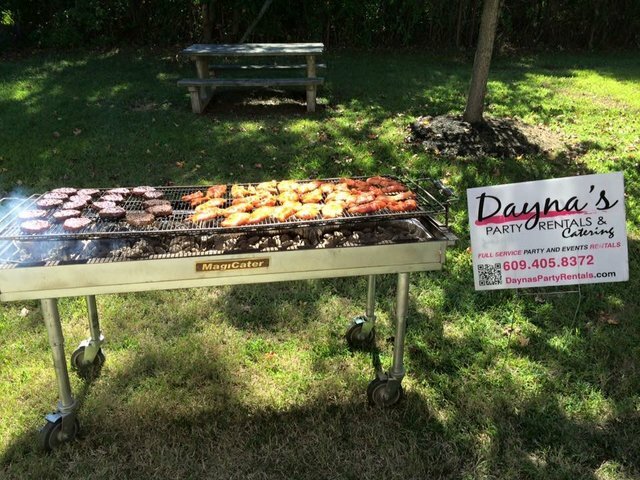 Customer supplies charcoal or We can supply charcoal for additional charge.Heavy-duty Event CHARCOAL BBQ grill. This grill can cook up to 65 hamburgers or 126 hotdogs at once with its 1,001 Sq. In. grilling space. NOTE CUSTOMER MUST LINE GRILL WITH LARGE DISPOSIABLE TIN PANS AND PLACE CHARCOAL INTO PAN FOR EASY CLEAN UP OF HOT COALS. BEFORE WE PICK UP CUSTOMER MUST REMOVE USED CHARCOAL AND HOSE OFF GRILL SO WE DO NOT HAVE TO PICK UP A DIRTY GRILL AND TRANSPORT IN OUR TRUCK DIRTY. FAILURE TO FOLLOW CLEANING INSTRUCTIONS WILL RESULT IN $50 TO $100 CLEANING CHARGE. Dont' t froget to add prep tables, coolers or any other party rental supplies.